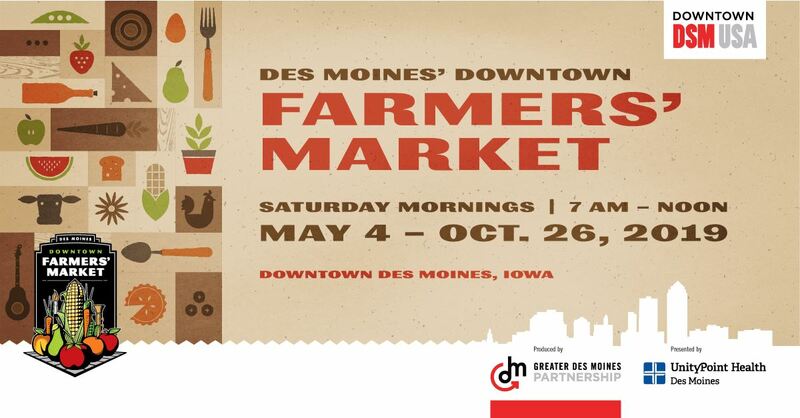 Soldier Creek Winery is making it’s debut at the Des Moines Downtown Farmers’ Market this year! Visit our booth during 11 dates of the Saturday Market. Visit us at our booth in front of Fong’s Pizza on 4th Street! The Market brings urban and rural communities together, supporting nearly 300 entrepreneurial vendors from 50 counties across the state. Nourishing the community, The Market offers diverse products including locally-grown produce, seasonal flowers, farm fresh eggs and cheese, locally-produced wine and fresh baked goods. Shop Iowa-raised meat including beef, pork, chicken, turkey, goat, rabbit, lamb and tilapia. Spanning nine city blocks, The Market experience also includes ready-to-eat foods, local artists, live entertainers, special programming and learning opportunities. The Market has become an icon in the community and often touted as “The Place to be and be seen on a Saturday morning” and has been touted by many national rankings, awards and publications.